Up from the past approaches the vision of an oldtime dream.This vision being the revision of the original dream that was conceived so long ago.A dream that still remains valid long after its initial conception. 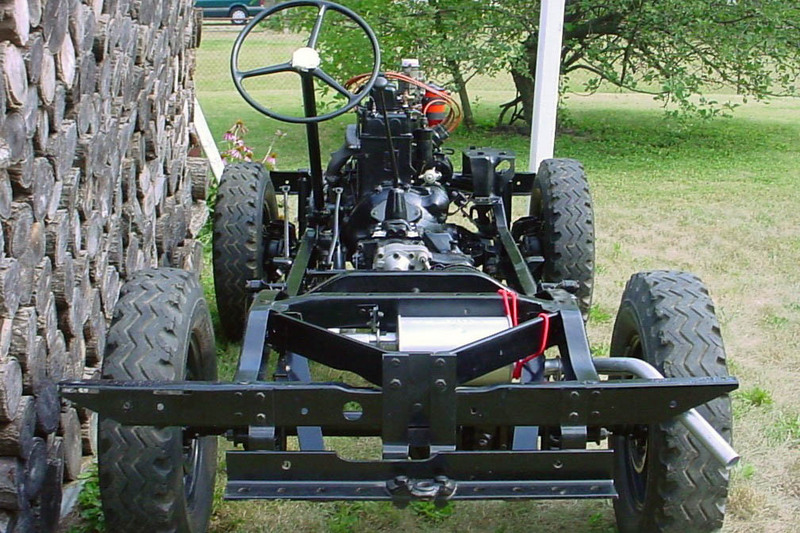 In the late 1940's one of the U.S. military goals was to realize a viable replacement for the warhorse of WWI. 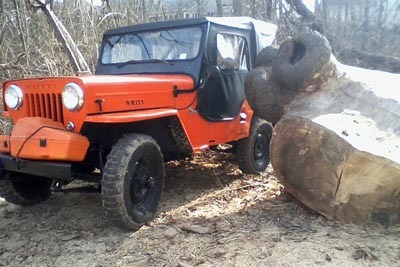 And from that effort we know the Jeep became a reality.History reveals that the jeep of WWII truly was a viable replacement for the war horse. 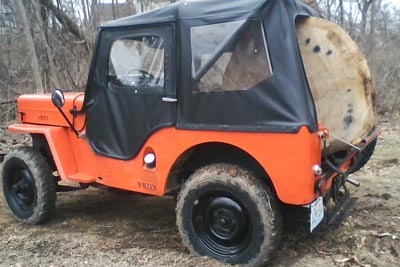 Though my use is not military, my need for a beast of burden is quite similar.This particular variation of the original concept is the famous CJ-3B, occasionally identified as the "horse-faced Jeep". This civilian horse-faced Jeep is no longer the horse of war. Just the same it does stand in as a direct replacement for the horse. In the background of this picture one can see a 10-mile-wide flood plain near the confluence of two great rivers, the Missouri and the Mississippi. 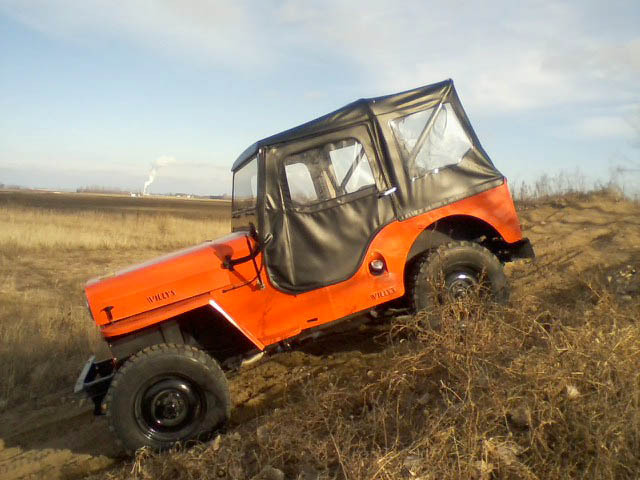 Due to its design the CJ-3B performs especially well as a an equine substitute.As you see it now this 50-year-old dream Jeep from 1964 has been revived.It has been fully rebuilt and so it remains ready and capable to serve its owner. 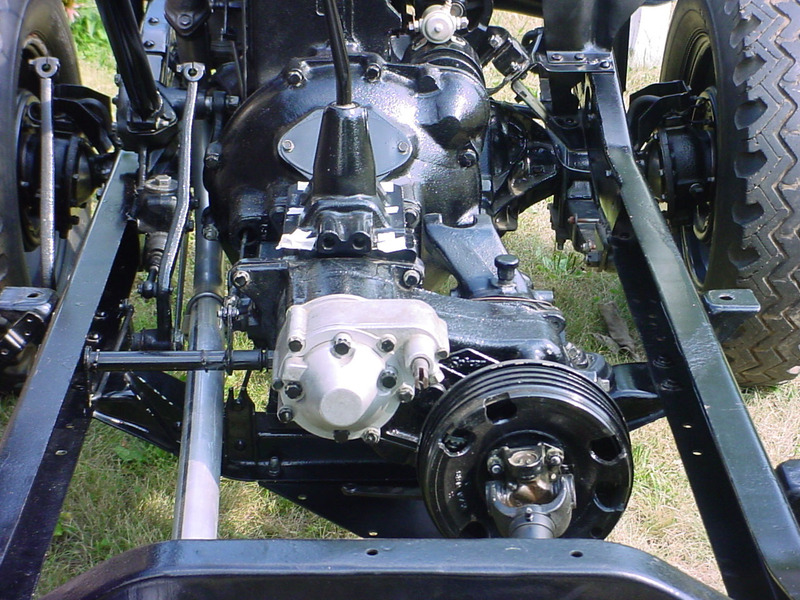 This picture shows the fully rebuilt and operable running gear as it appeared in 2007. 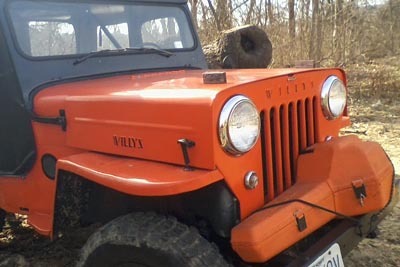 This 1964 vintage Jeep was rebuilt to duplicate the original stock standard configuration.However it does sport a few of the stock options for that year, including factory-type fuel filtration, low 5.38 gearing, and the Warn O.D. unit seen here. 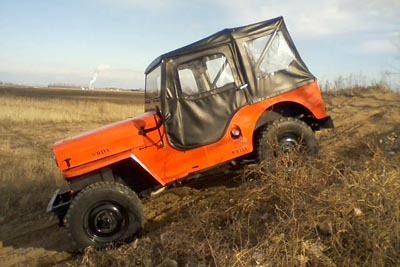 This Jeep can readily function as a pleasure horse, a draft horse, a plow horse, a work horse, and also as a sure-footed pack mule.And for most of those reasons I have long ago chosen to "drive" the team of various model Jeeps.To date I have found the CJ-3B variety to be the most dependable and effective replacement for the horse. 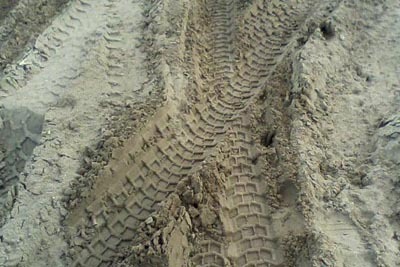 During the rebuild process I was never intent upon a true restoration.I rebuild as I see fit. 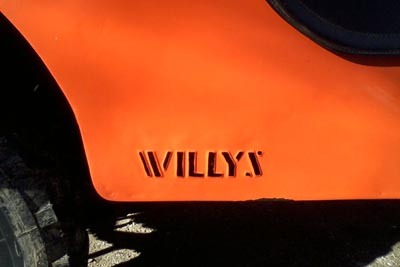 I keep everything stock standard unless I have practical reasons for deviation.Virtually every new part used herein is genuine OEM NOS.This particular body tub was repaired using 100% genuine Willys sheet metal.Here you can see how I took an old 3B hood and repaired quarter panels using the "Willys" script. 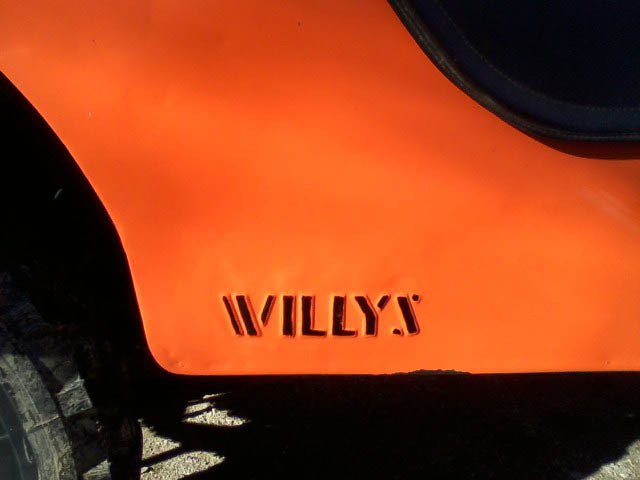 The Allis-Chalmers Orange paint was chosen for multiple reasons.It does not show dirt, it is very similar to the Willys "Transport Yellow" and it is a safety color for slow vehicles.Besides that, I had need to use up my old paint supply. 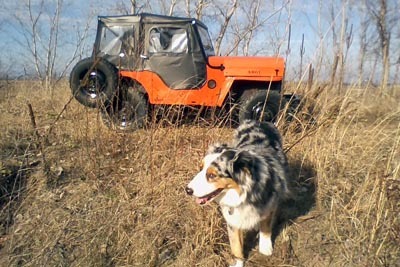 I often use my horse-faced Jeep for general pleasure and travel.In fact I use this Jeep everywhere I go, and these Australian Shepherds are ever by my side. 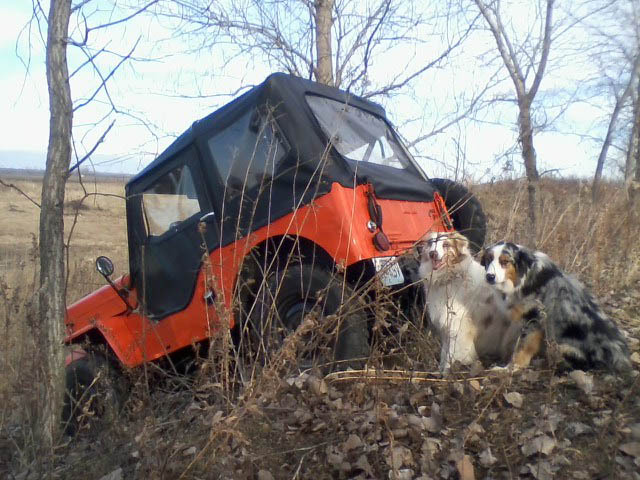 Here you can see my colorful blue merle female named Gracie and my blue eyed red merle male named Copper. 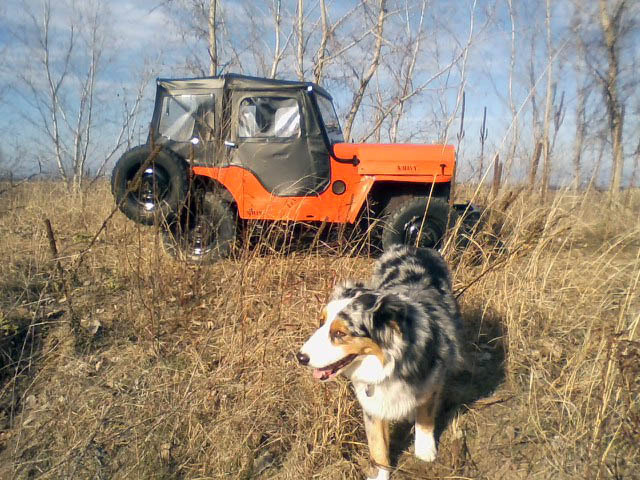 I have been especially fortunate to own some fine Jeeps and dogs over the years.In the forefront you see Copper, who is not shy in any regard.My previous Aussie named "SKY" was the finest dog I ever knew BC (Before Copper. 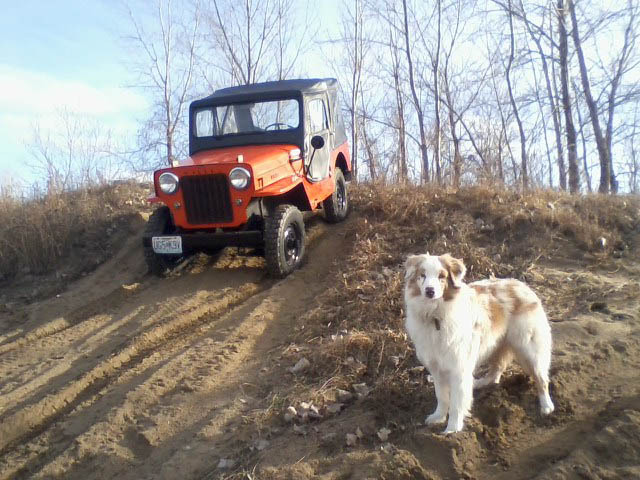 )Copper had huge footprints to fill and has done an exceptional job of filling the void.We were out playing this day near the Missouri River. Here you see mounds of river sand that remain from the Great Flood of 1993.In the background you see the 3B with a rare optional 3B chaff screen attached.This particular 3B is pretty nice but not an equal match to my previous daily driver. 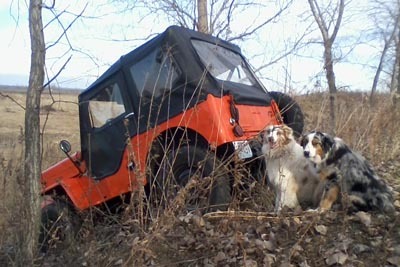 My long time neighbor of nearly 60 years was not able to fulfill Gracie's exercise needs.I took Gracie on last spring when she was terribly overweight from inactivity.I frequently exercise these shepherds long and hard.She eats everything in sight and I can barely keep enough weight on her these days.In the background is a good view of the Jeep's air intake for the optional Harrison "fresh air type" heater.Also the aftermarket Tigertop and standard side-mounted spare.I never before had an actual side-mounted spare, and decided I needed to try this out at least once.It makes an excellent side bumper when backing between narrow trees. I well remember my early days growing up while frequently watching my father work his business.In 1964 I began to help my father in earnest at the the age of 9.I learned then, and still today define work to be physical labor and nothing else. 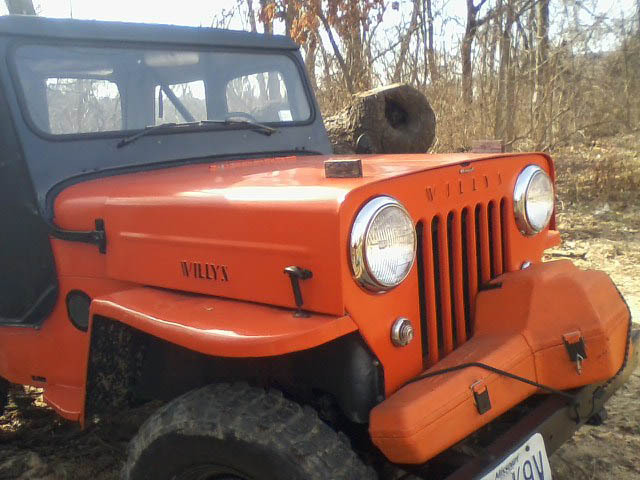 Here and now I remain in a world that demands a certain amount of physical effort.The CJ-3B can solve many of the major labor demands that are made upon me.At one point I had several horses and quickly found them too expensive to be practical for all of my current needs.Yet this 1964 Jeep is currently serving my needs with excellent results. 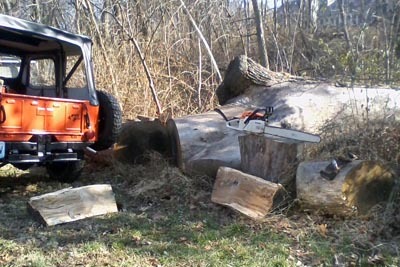 I have worked various jobs over the years.At one point I worked at an oldtime sawmill deep in the remote Ozark forests, and right alongside working draft horses .My eyes bulged wide when I first witnessed a Percheron skidding in huge fresh cut oak and hickory logs right up to the buzz saw.Seeing a true workhorse at work, one can only then grasp the concept of "real" horse power! 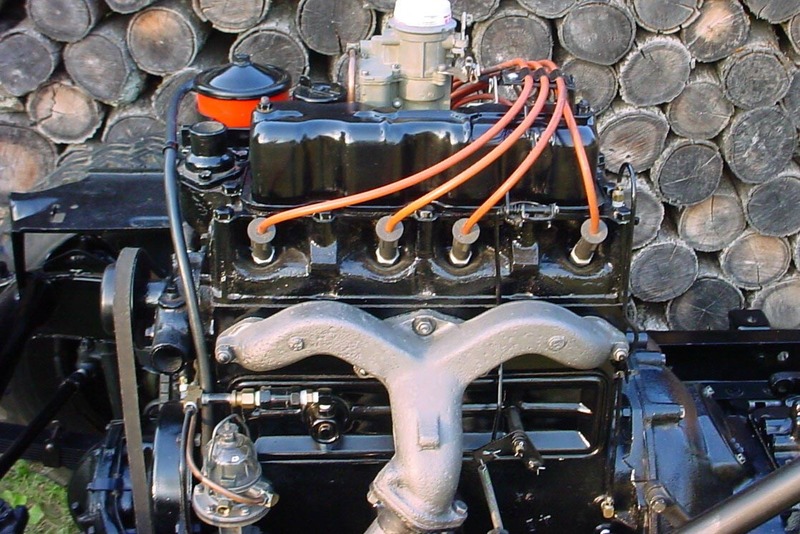 Honestly my horse-faced Jeep is ridiculously overrated at the suggested 72 HP.This modern concept of HP provides no consideration for mass and weight. 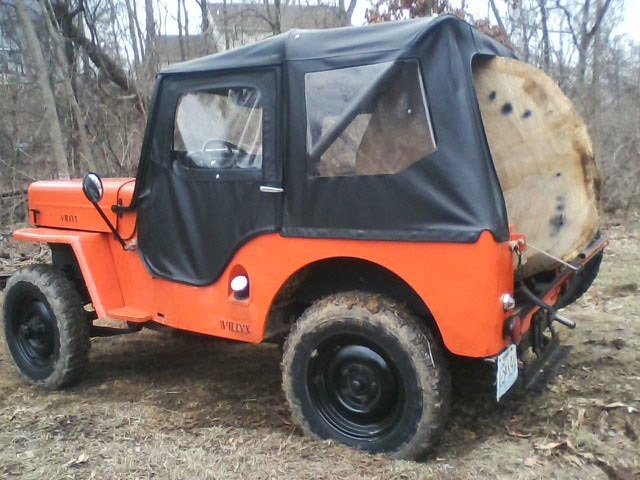 Still today I keep a related version of the workhorse vision alive.I work this Jeep during my woodcutting and hauling forays.The working CJ-3B fits into really tight confines yet can tug, pull and haul out respectable loads of cordwood all because of its equine nature.It is easy to drive and it is an easy keeper.If need be I can even put it up cold and wet. 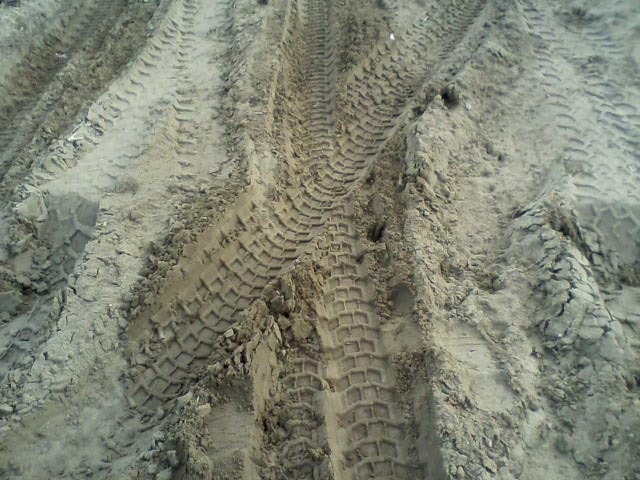 In part it is sure-footed thanks to its tires which are "Michelin X" 6.50R 16 XCL. 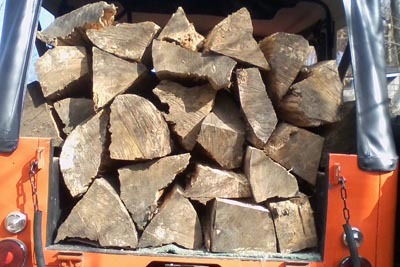 Let's face it; winter chores mainly consist of staying warm.Like they say, there's nothing else like wood heat because it warms you twice.I fully agree and will add that only a fool would cut wood during the other 3 seasons unless he has no option.For the first warming I prefer to split wood in freezing weather.I usually find myself comfortable when stripped down to my "tee" shirt if it's 32 degrees (F) outside.Know that for my tastes, the sledge, the wedge and the maul are all still in fashion. 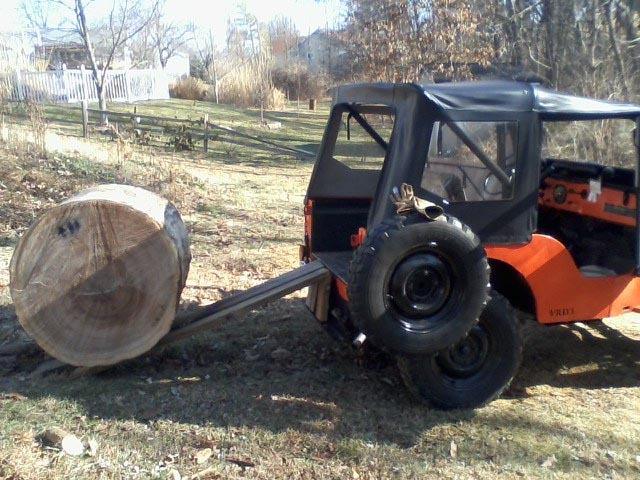 Last season's winter woodlot was made available courtesy of a tornado from early that same year.To get access, the 1964 Jeep had to maneuver on narrow tracks between trees to reach the downed timber.Tracks so narrow that I had to keep a close eye on the door handles. 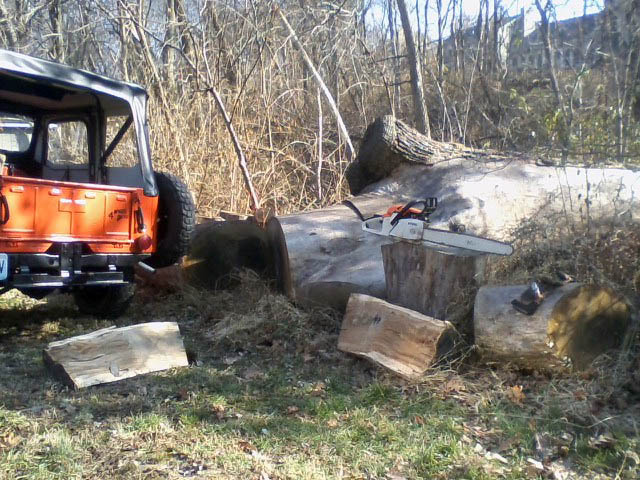 This year's woodcutting chore is in another location but the timber was downed from the same tornado.A year and a half previous, I had topped this large swamp white oak and left the huge remaining trunk to dry for another season. Seen here, the top knot alone was 6 feet in length. White oak normally takes a full two years to dry because of the toluene in it.This big white oak was certainly not dry after nearly two years with the 3-inch-thick bark peeled off.Here again the access was very limited in and out.Only a narrow-track Jeep could squeeze into position and pull the steep grade. 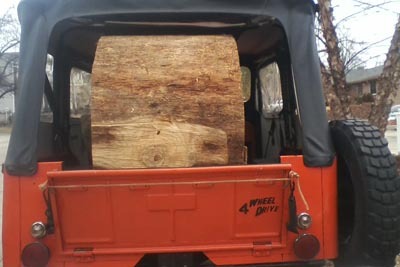 And anything smaller than the Willys simply could not haul out the ample wood supply. 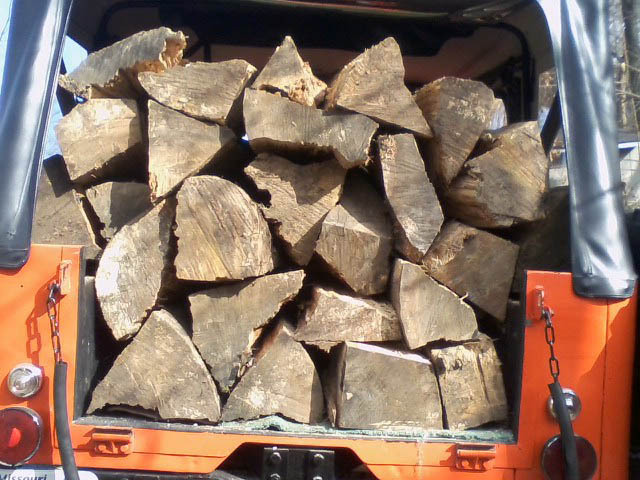 Most of the wood was split on site, prior to loading it.Here you see a typical 3B load. Note the parking lamps added as blinkers. 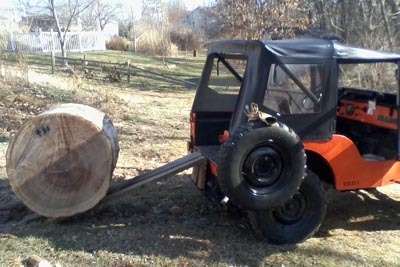 I eventually got down to a 14-foot-long section of straight trunk.I decided to load the remaining sections of knot-free trunk without splitting.Seven large remaining blocks were all cut to my preferred 24" length.The round blocks ranged from 36" diameter nearest the top knot, to 48" diameter at the buttress.I amazed myself how I was able to cut through a 48" diameter log using a 20" long bar! 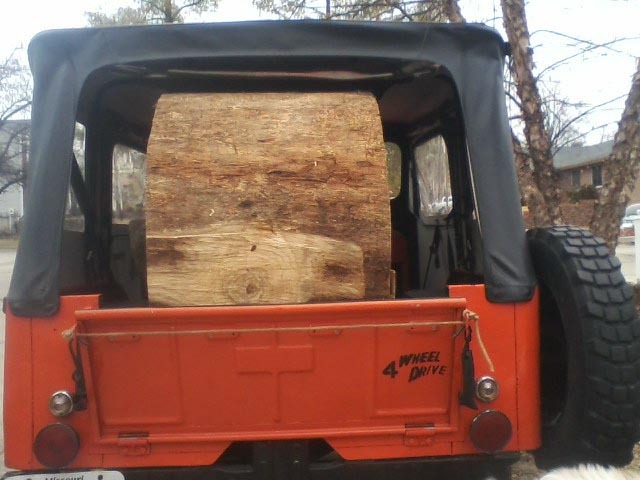 The Willys was used to tug each large block uphill where I would then roll each block into the Jeep's bed.Here is my first attempt to load up the smallest 36" diameter block.Before I even got this one loaded its tremendous weight crushed the 2"x 6" ramps seen here. 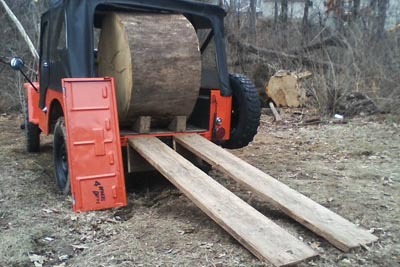 Being determined, I upgraded my ramps with hard 2"x10" planks.I began loading the smallest block from near the top knot area and they progressively increased in size.After a piece was loaded I could see that the leaf springs were not yet at their working limit. 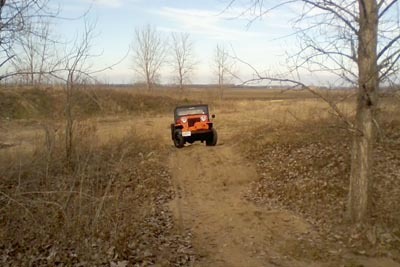 With a typical block I saw a full 1-1/2" gap before the axle tubes hit the bumpers. As the blocks reached ever greater diameter, the head room diminished.With vinyl rear window tucked up high, it could be kept from rubbing on the block.These old working Jeeps and their parts are just too expensive to sustain damage.I used 3/8" plywood to protect the bed.In that fashion, each two-foot section was hauled safely and without damage. 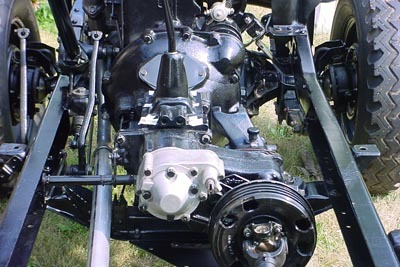 It was impractical to spin each block sideways in the bed, so as the diameters increased they would be centered ever further behind the rear axle, and the driving would become more and more treacherous. 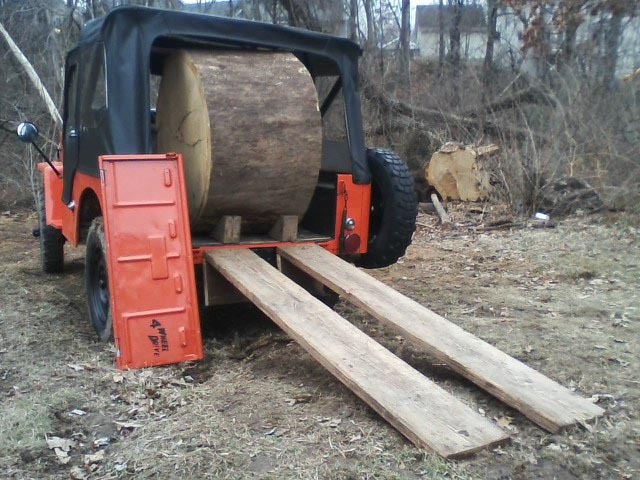 Having a need to "KNOW", I always push things to their limit.The tree buttress at 48" maximum diameter was just too big and swollen for easy loading without trimming it down.The next section up from base was a perfect circle measuring 42" diameter.I considered that one to be the maximum safe load.It was a bit unnerving to haul that 42" block on a day with a steady 20 MPH breeze. 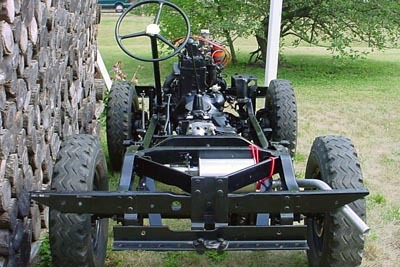 The weight alone was no problem for the 72 horses, traveling up to 50 MPH.It's just that the steering was too light; especially in the stiff breeze.Speaking of breezes, it was a real breeze to unload each section as it rolled back down a set of ramps. 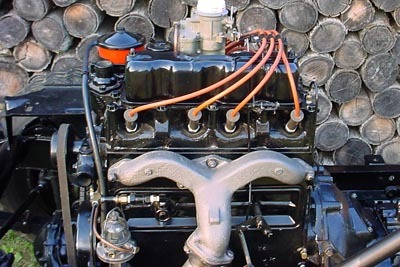 After all this talk of horsepower; I was finally able to prove that a "Big Block" can be installed into a Willys Jeep without modifications.The block seen here is around 38" diameter or 27,218 cubic inches.For metric folks that's about 446 litres. 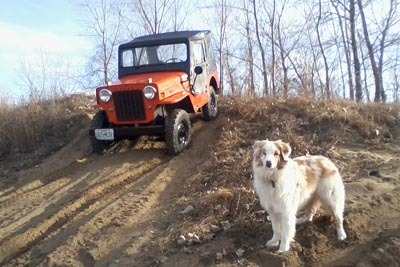 See Ken's '53 CJ-3B in A Man and His Jeep. 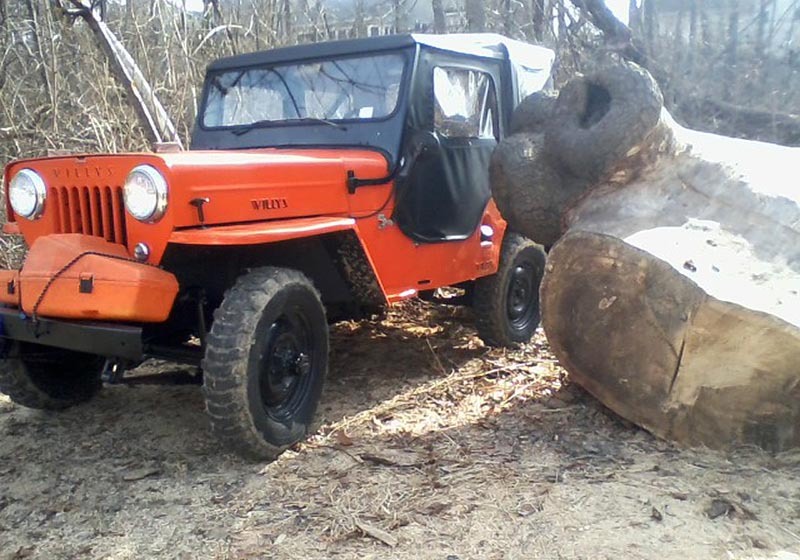 See also comments from Ken and others on hauling 20 Cubic Feet of Firewood on CJ3B.info.